It was August 19, 2017. As an American of South Asian descent, it had been a painful week for Jay -- and for the country in general. The Saturday prior, white nationalists and counter-protesters clashed violently in Charlottesville. "It was a tough week to be a person of color in America. I talked to my friends and family on the phone a lot. As we watched the news, there were feelings of sadness combined with helplessness." Then Jay came to Inglewood, CA to build a playground. "I think it's easy to feel overwhelmed by today's news. But I realized that when a sense of helplessness sets in, it's a sign to put some good back into the world. 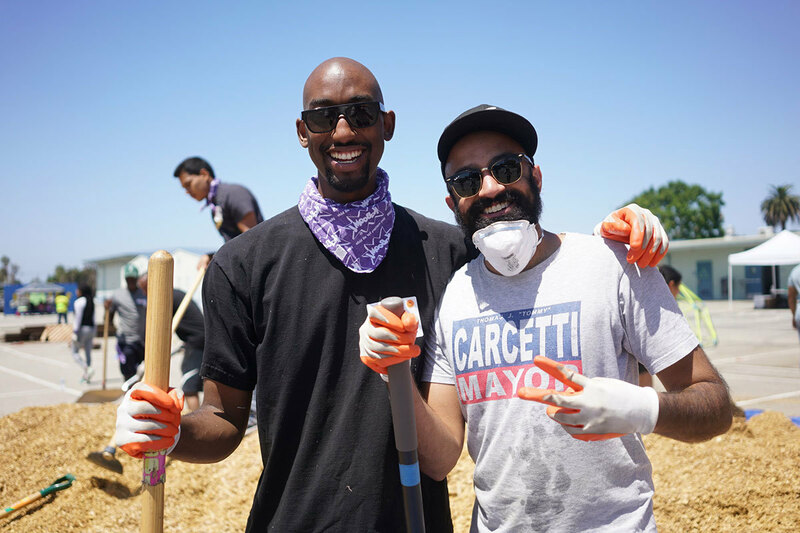 After such a tragic week, working together with people of different races, religions, ages and backgrounds all to build a playground for kids was such a cathartic experience that gave me hope." Jay shoveled mulch into the new playspace. He was working alongside people he'd never met, but it felt as though he'd known them for a long time. After a week of emotional withdrawal, Jay was beginning to feel like himself again. As the mulch pile got smaller, a spirit of camaraderie grew with the other volunteers. Then, across the playground, he saw a familiar face. It was Jermaine; an old friend he had worked with a few years back. "It was so fun to see him. We caught up and I asked him what had prompted him to volunteer that day. Turns out that as a kid, he had gone to the school where we were building the playground -- Parent Elementary School -- and was pumped to help the current students get their first real playground." The old friends worked side-by-side, chatting and laughing for hours. At the end of the day, they joined the full team of volunteers for the ceremonial ribbon cutting to celebrate the completion of the brand new playground they'd helped to build together. "I underestimated how cathartic it would be to do something so basic as shovel mulch. To be part of a team of people coming together to physically build something for kids." said Jay. "It was medicine." Jim had retired from his business and was volunteering as an academic mentor at a school in a low-income neighborhood. One day, he stopped by the principal’s office and found her terribly upset. A student had just fallen off a piece of equipment on the school playground and suffered a concussion. The principal happened to have a catalog from the playground equipment company Landscape Structures in her filing cabinet. They began poring over the catalog and Jim soon enlisted the help of Landscape Structures to come up with a plan. 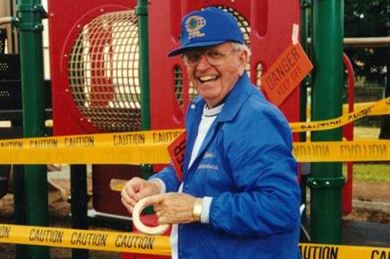 When Jim took the plan to the school’s Board of Directors, they proposed that he and his local Kiwanis club build the playground. 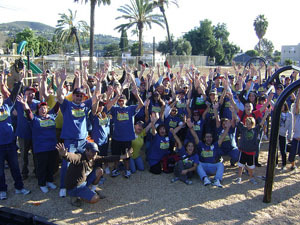 A recipient of multiple Let’s Play Completion Grants from KaBOOM!, Jim acknowledges that the hardest part of building a playground is coming up with the funds. Beyond that, all it takes is a can-do spirit and a hardworking group of volunteers. The community build model that Jim has helped to popularize across the Napa Valley has not only saved the county over a million dollars—which they have used to invest in other park projects—but has helped the community feel more invested in the end product. 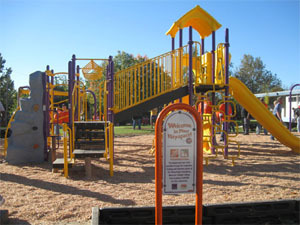 "My son's school (ATCPS) in Sacramento, Calif., received one of your playgrounds earlier this year. For the last year and a half since the school opened, (was originally a high school), my son and his school-mates only had a few basketball hoops and a soccer field to play on. He would come home and be so upset because he missed the playground he had at his old school. He kept telling us how when ATCPS would get the new playground, he'd be able to climb to the top and be the best at the monkey bars. Well, just the other day, he came home extremely excited because he was able to make it all the way across in the bars. I think to him, it was the best day of his life so far. All I can say is THANK YOU! for bringing joy to my son and the rest of the school. I know they are a happier bunch!" Play it forward with a donation today to help more kids like Theresia’s son learn about the joy of making it all the way across the monkey bars! "Late afternoon one day, when I was just six years old, I heard a series of loud cracking noises. Suddenly, my grandmother pushed me and my sister down and threw her body on top of us. When we woke the next day, I learned that a drive by shooting happened the night before. It was in that moment that I became aware of the reality of poverty and violence in my neighborhood. Although my father was addicted to drugs and never around and my mother struggled to raise my sister and I on clerk’s wages, I was blessed with teachers, family and community members who helped me stay focused on my dreams and efforts to go to college. It wasn't until I visited South Africa in 2001 and saw shanty towns, that I understood where poverty, privilege and power intersect and realized that no one should have to grow up the way I did, or for that matter, the way the South African kids were either. As I grew older, I came to learn that 31 people in my family were in prison, and just 1 of us was in college - me. I went on to graduate school and decided to return to my community, Inglewood, to teach critical literacy to black male youth at Morningside High School and help them experience what I felt when I went to South Africa. At Morningside, I founded the Black Male Youth Academy where I work with students and community members to use research in order to identify social issues in our community and then find solutions. Two years ago, they decided to tackle food justice and began an initiative called "100 Seeds of Change" where they are creating 100 urban gardens – community, school and home gardens. Our program got a big lift this March at a KaBOOM! playground build where my BMYA students led the construction of a wonderful new community garden, next to the brand new playground in Inglewood. That day, we helped move the 20 tons of soil into over 50 garden beds that were then filled with vegetables, fruits, flowers, and plants. There was a stage and 9 benches to transform a once unsavory concrete desert into an outdoor classroom that stood in front of a custom mural. Two picnic tables turned a barren wading pool into a pleasant lunching spot. A storage box was placed near the garden beds for onsite access to tools and supplies and future plans include the building of an 'outdoor kitchen' that will allow for the community to grow, harvest, prepare, and eat in the same space as where they play and gather. Both myself, and my students left feeling empowered at the end of the day, and I know we’ll be able to do even more now." Dart was already a leader in his community, and with the help of KaBOOM! he was able to empower even more people. Play it forward today to help us work with more leaders like Dart. “I have been fighting against a rising tide of needs in the Spring Valley neighborhood of San Diego for over two decades, always just barely keeping my head above water. For so many years Spring Valley has been defined by what it lacks, not by what it has. We have an incredibly rich culture with people from every walk of life and background, but what everyone outside saw was an unsafe and transient community. Every year 25% of our school population moved – Spring Valley was an epicenter of foreclosures in 2008 and 2009. As a former juvenile probation officer I know you needed to invest in people early, and that just wasn’t happening. Then, in February of this year, I was thrilled to help bring about the physical manifestation of the change my community needed. KaBOOM! built a bright, colorful, gorgeous new playground at the Spring Valley Community Center with a walking trail and a community garden. Barbara knows that where you live says a lot about who you are, and her community is now a place where people want to invest and spend time in. Play it forward to help grow other communities across the country. 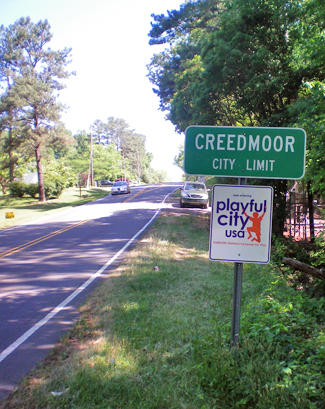 This week, we are proud to honor 151 cities and towns across the country that make play a priority and use innovative programs to get children active, playing, and healthy. 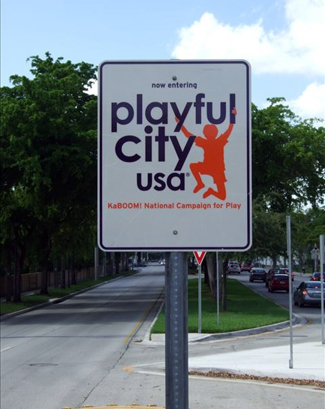 Playful City USA, a national recognition program spanning 38 states and one territory, asks honorees to develop unique local action plans to increase access to play in their communities. 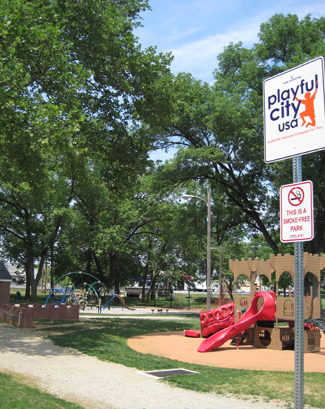 In the fifth year of the annual program, 19 Playful City USA communities received recognition for the fifth consecutive year, 24 earned honors for the fourth time, 29 for the third time, and 30 for the second time, while 49 claimed their first Playful City USA designation. 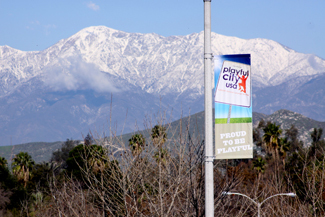 Towns and cities across the country are showing off their Playful City USA pride. 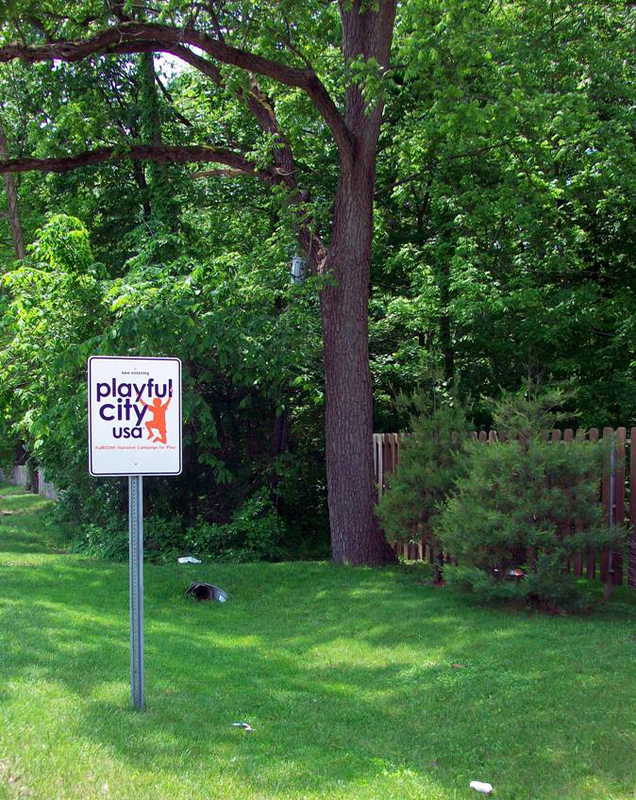 Is your hometown celebrating its Playful City USA honor? Send us photos and we'll feature them in a future blog post! 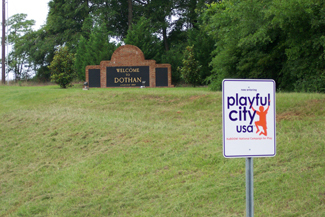 Is your city playful? See our full list here. Our build with First Lady Obama and Calif. First Lady Shriver is in the news! Here are some stories about our build with CaliforniaVolunteers, First Lady Michelle Obama, and First Lady Maria Shriver June 22! Next week's Conference on Volunteering and Service in San Francisco, Calif. will not only feature First Lady Michelle Obama and California’s first lady Maria Shiver during the opening session, but will also serve as the official kick-off to the United We Serve summer initiative, a program intended to renew the American spirit of volunteerism and service. As part of the events surrounding the conference, KaBOOM! and California Volunteers will partner to build a great new place to play at the Bret Harte Elementary School in San Francisco, Calif. on Monday. KaBOOM! will also premiere its United We Serve program, "Pledge Allegiance to Play" next week. Pledge Allegiance to Play will provide volunteers, new and old, with ways they can engage with local issues and improve their communities. Visit kaboom.org then to see all the exciting things you can do to support your community! The Conference on Volunteering and Service, co-sponsored by the Points of Light Institute and the Corporation for National and Community Service, will serve as the world's largest gathering of volunteer and service leaders from the nonprofit, government, and corporate sectors and aims to recharge, engage and bring back new ideas and civic energy to strengthen the reach and impact of the participating organizations.